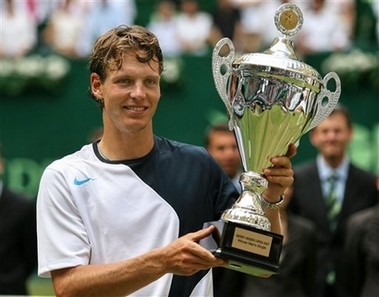 HALLE, Germany - Tomas Berdych of the Czech Republic beat Marcos Baghdatis 7-5 6-4 on Sunday to spoil the Cypriot's 22nd birthday party and win the Halle Open. Fourth seed Berdych, beaten by Roger Federer in last year's final, was too consistent for Baghdatis this time as he wrapped up victory over the eighth seed in one hour 20 minutes. The win gave Berdych his third career ATP title and his first on grass. Federer's decision to pull out of the tournament after he complained of fatigue following his loss to Rafael Nadal in the French Open final left the competition wide open. From the start the 21-year-old Berdych looked one of the favourites with his strong serve and aggressive ground game. He reached the final without dropping a set and his all-round strength meant he was always in command against Baghdatis, who reached the semi-finals at Wimbledon last year. Berdych was in trouble just once on his serve in the first set, when Baghdatis missed two break-points in game 10. Berdych responded to the let-off by breaking his opponent in the next, with Baghdatis putting a forehand wide under intense pressure. The Czech then served out confidently for the first set. Baghdatis was immediately under pressure at the start of the second, with Berdych going a break ahead with a stunning backhand down the line with his first opportunity. That, ultimately, was to prove decisive. Berdych saved one break point as he served for the match before going on to clinch it with a booming forehand Baghdatis could not get back.